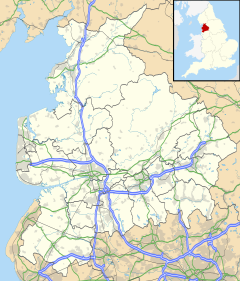 Leyland is a town in the South Ribble borough, in the county of Lancashire, England. It is approximately six miles (10 km) south of the city of Preston. The population of the town was estimated as 35,600 at the 2011 Census. Throughout the 20th and 21st century, the community has seen a large growth in industry, population and farming. The name of the town is of old Anglo-Saxon origin, meaning "untilled land". English Leyland was an area of fields, with Roman roads passing through, from ancient Wigan to Walton-le-Dale. It was left undisturbed for many centuries until rediscovered shortly after the Battle of Hastings (1066). Leyland is mentioned in the Domesday Book (1085). In 1066, King Edward the Confessor presided over the whole of Leyland. The manor was divided into three large ploughlands, which were controlled by local noblemen. In the 12th century, it came under the barony of Penwortham. The area of Worden, which is now Worden Park, was one of nine oxgangs of land granted to the Knights Hospitaller, by Roger de Lacy, in Lancashire, but the land was not assigned to any individual and a local man, who was a very close friend of de Lacy, Hugh Bussel, was assigned holder of the land in 1212.
Notable features that remain include the St Andrew's Parish Church, built around 1200 AD and the large stone Leyland Cross, thought to date back to Saxon times. The town is famous primarily for the bus and truck manufacturer Leyland Motors, which between the 1950s and 1970s expanded and grew to own several British motor manufacturers, including British Motor Corporation, Standard-Triumph and Rover, culminating in the massive British Leyland company. The truck business still operates today as Leyland Trucks, and is owned by Paccar. Leyland is also home to one of the leading maintenance and utility companies in the United Kingdom, Enterprise plc on Centurion Way. The Leyprint company is situated on Leyland Lane, a company which produces menus and other printed items. A large superstore of Tesco was built in July 2002, and it stands near the police station. The old BTR Factory was knocked down to make way for new housing in 2004, and in July 2006, the town was installed with a Morrisons, a Homebase (which closed down in the end of 2014, and was replaced with The Range) and an Argos. The Leyland Band have also recently moved to the town, after several years in various other rehearsal locations, and now have a permanent home in Farington Business Park. Chronic 4 is a professional eSports organisation from Leyland participating in tournaments for games like Wii Sports. Leyland railway station is on the West Coast Main Line and is operated by Northern. There is one train an hour between Liverpool Lime Street and Preston. There is also one train an hour between Manchester Victoria/Hazel Grove to Blackpool North. There is a marker adjacent to the old Leyland Motors Spurrier works declares the halfway point on the railway journey between Glasgow and London, some 198 miles in either direction. John Fishwick & Sons served the town's public transport needs. They also connected the town to Chorley and Preston. The company ceased trading on 24 October 2015, and Stagecoach Merseyside & South Lancashire have taken over their core route 111. High schools in Leyland include Balshaw's CE High School near Leyland Cross, St Mary's Catholic High School, Worden Sports College, a smaller high school situated to the west of the town and Wellfield High School near the town centre. To the east of Worden Park is Runshaw College. The college received the best Ofsted report, for any further education college in the United Kingdom, for the year of 2005. Most of the housing in Leyland falls under the semi-detached, detached and bungalow categories. There are a few modern housing estates, but about 65% of the accommodation in the town was built in the 1970s. Leyland is made up by six different areas, the town centre itself counts as the main retail side, with the railway station, library and shops nearby. The other areas include Broadfield, Moss Side, Worden Park, Turpin Green and the Wade Hall estate. ^ Population of 35,578 is the sum of the following ward populations: Moss Side 3673; Earnshaw Bridge 3722; Golden Hill 3982; Seven Stars 3701; Lowerhouse 4050; Leyland St. Mary's 3562; Leyland Central 3626; Leyland St. Ambrose 3337; Leyland St. John's 5925. All accessed 30 September 2011. ^ "John Fishwick & Sons". Fishwicks. Wikimedia Commons has media related to Leyland, Lancashire. Wikivoyage has a travel guide for Leyland. This page was last edited on 7 March 2019, at 15:31 (UTC).